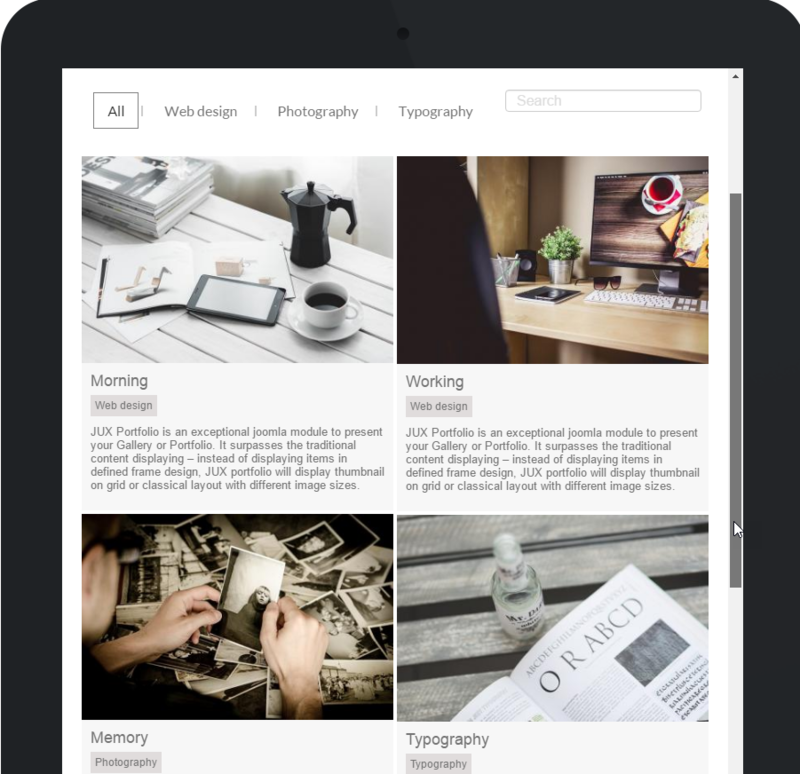 JUX Portfolio displays thumbnails on grid and does not require you to use same-size images. 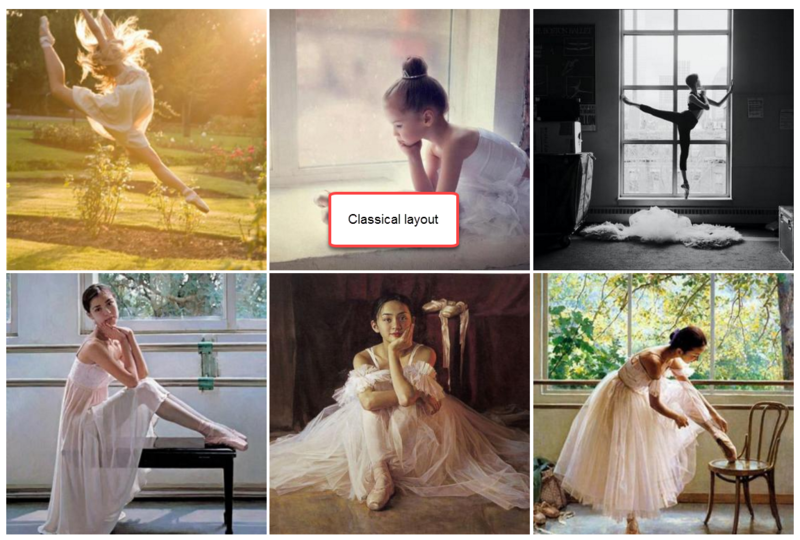 With classical style, your images will be displayed neatly in grid. In backend it has many configures that could help you display with different style. For example: display image with short description, or between images don’t have margin. Display with many of column in 1 row, different color when hover. Just take a look at our demo and witness the beauty of JUX Portfolio. Image, Youtube, Vimeo video Support. 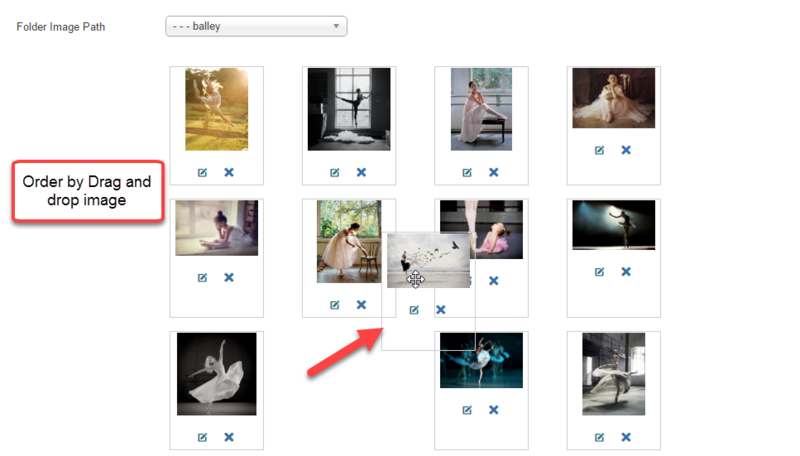 This tab,You can choose folder image path for your gallery. After that you can enter arbitrary detail for each image as Title, link or description…, moreover you can upload, delete or drag & image order for Slider. Title: Enter the tile for each image. Tag: Enter the Tag that can be filtered for each image. Video ID: Insert Video ID when selecting Video type. Sub Description: Enter sub description for each image. Description: Enter Description for detail Item. Choose How to display your Gallery in frontend. 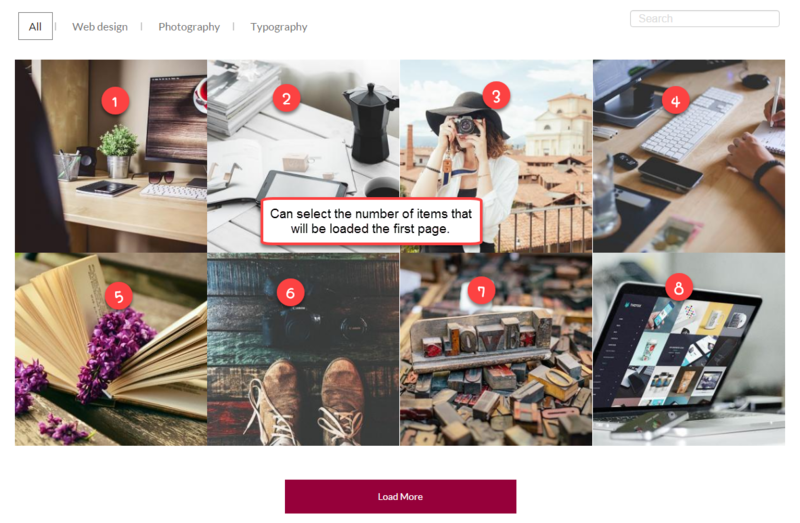 You can choose to display Grid style or Classical style, Set Item number will for the first load and number items will show when click loadmore. You also can choose to display sub description, Title, Tag, Filter ….And you can set the distance between the box item. Item Display: The number of items displayed in the first load. Item Offset: The number of items view loadmore. All Tag: Show/Hide All Tag( Only used when Filter is yes. Position: Select the position for the filter. 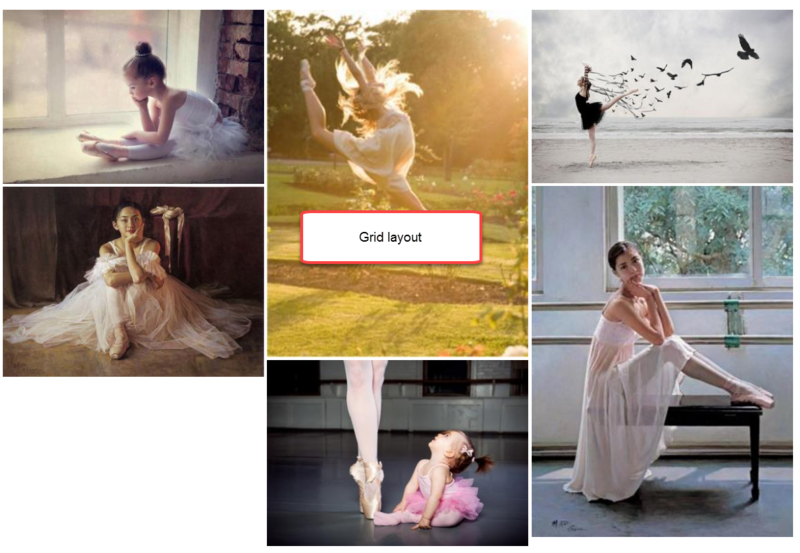 Site Style: Choose how to display the Grid layout or Classical layout. Crop - Resize Image: Show/Hide Crop - Resize. Max Height Image: Max height image after Crop. Max Width Image: Max width image after Crop. Background: Select background for text layout. Item Height for Classic: Enter height of item, eg:100. Margin Item: Set the distance between the box item. Show Title: Show/Hide title of article. Show Tag: Show/Hide Tag of article. Show Description: Show/Hide description of article. Sub Description: Show/Hide sub description of article. The number of items displayed in the first load. This is the filter when being enabled. If your site displays many products, the filter funtion easily helps to seach for the same category and also search by entering the keywords in searching box. By this way, You don't have to scroll mouse to find out what you are looking for. This Tab, you can set column number of popup, Show/Hide Title, tag and Icon Style, color.. when hover item. Show Tag: Show/Hide Tag when hover on each image box. Icon Style: Show/Hide the icon when hover on each image box. Icon Options: Choose the type is text or images for Detail-Link. Hover Style: Select the type when hover. Choose How to display your Gallery in frontend. You can Select column number will show on Desktop, Tablet or Mobile. You also can Enable jQuery and custom css if need. Show on Desktop: Show the number of columns on Desktop. Show on Mobile: Show the number columns on Mobile. Enable noConfict: On/Off noConflict. Turn it on to prevent conflict with Joomla's Mootools. Enable jQuery: On/Off jQuery. Turn it off your site already have jQuery loaded. Custom CSS: Custom CSS for the item to change the screen size (@media).